Sorry, this isn't going to be about psychotherapy. 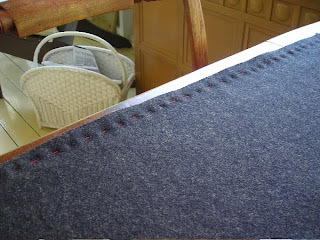 It's about preshrinking wool fabrics. I'm not a big fan of dry cleaners, so I'm going to do the London shrink method. It's surprisingly easy, and today was the perfect day for it -- hot and not too humid. 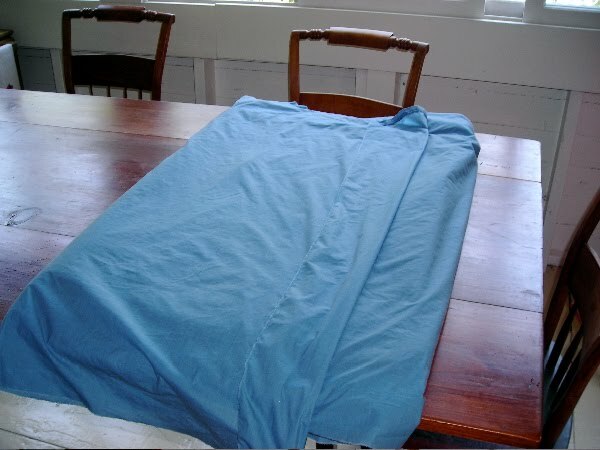 I tore an old twin sized cotton sheet down the middle, soaked it and wrung as much water as possible out of it. The strips of sheeting are then laid onto the folded wool which has had its ends basted together. The two layers are then folded toward the center forming a loose package of wool layered with wet cotton. Additional damp sheeting covers the entire package to prevent it from drying out too fast. 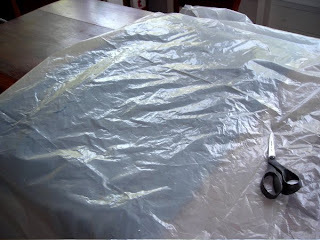 Since it was quite hot and dry today, I went even further and covered everything with plastic sheeting. 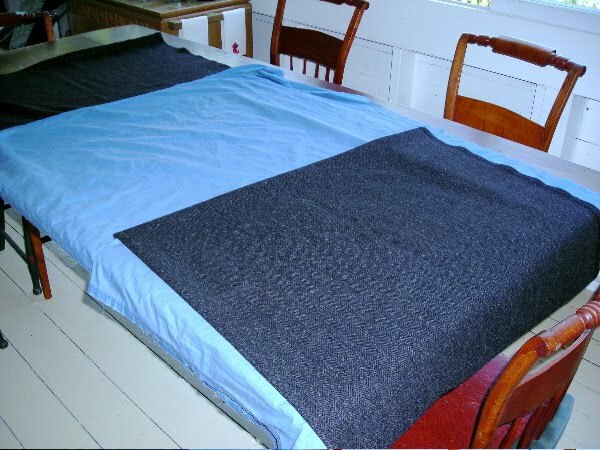 The fabric sits for 3 hours and the moisture is gently absorbed into the wool. 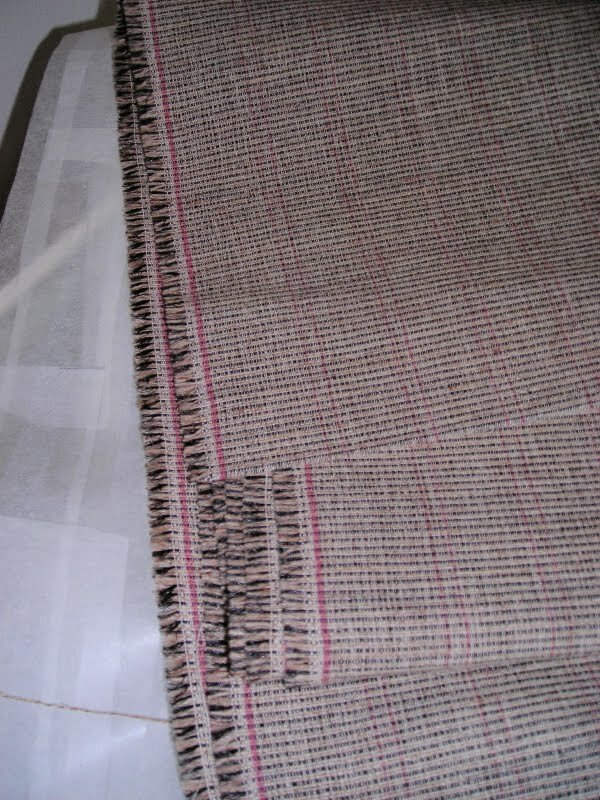 The sheeting is removed and the slightly damp wool is smoothed flat by hand. 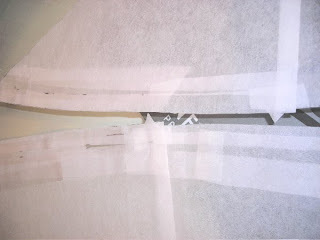 I can't believe how much softer this process has made the hand of the fabric. 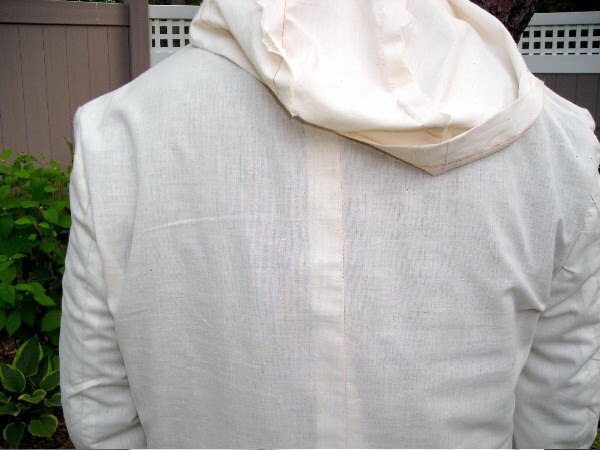 Where the fabric was basted there is now a puckered edge. 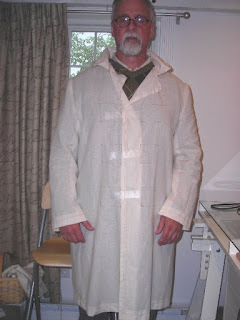 Proof to me that the fabric really did shrink. 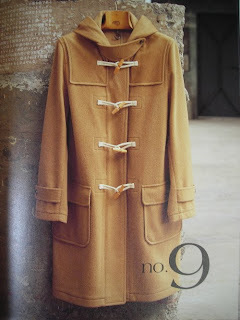 I don't think the fabric should require anything more than a light steaming. 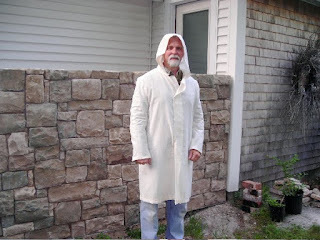 Hard to believe, but I'm inching closer to cutting out the coat. The quest for "grain perfection"
Apparently if I want a high quality garment that will fit and hang well, I must first attain grain perfection. Essentially, this amounts to squaring up the length of fabric. My fabric had been "sampled" multiple times in the store, and one edge was very ragged. I clipped into the selvedge above the sample gouges and started to pull a single weft thread. 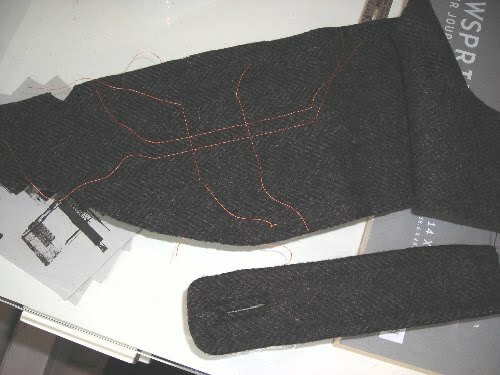 This produced a gather which had to be patiently worked across the fabric as the thread was removed. Simple, just a little time consuming. But heck, nothing about this project is going to be fast. 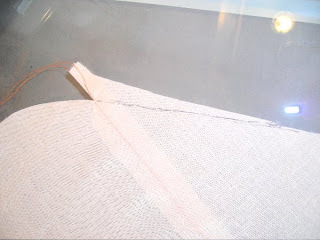 As the thread broke I could hold the fabric up to the light and cut along the line that was being formed. 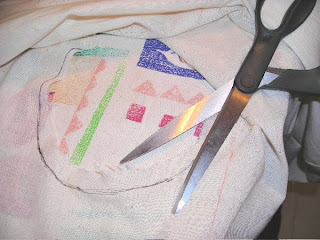 Once both ends were squared, and with the fabric folded down the center, I evened the ends and basted them together. The Bishop Method goes into great length about the glories of hair canvas. Hair what???? This was a new one for me, and a quick Google search proved that it does, in fact, exist. Sorry, but I didn't even consider looking for the stuff at my local JoAnn Fabrics, the only fabric store for miles around, and one that I hate with a passion. I shop there as little as possible. 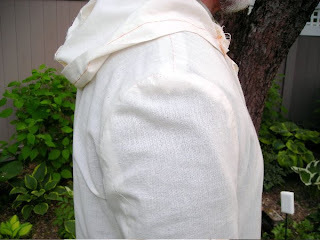 My last visit to JoAnn's was for 4 yds of unbleached muslin. The salesperson actually had to measure it out twice, all the while smoothing and stretching it out so that I wouldn't get even 1/4" more than exactly 4 yards. Mind you, this purchase was an extravagant $1.49 / Yd! WTF Obviously some corporate MBA has done an analysis of how much profit is lost by giving the customer a few extra inches. I'd love to hear from other JoAnn Fabric haters. I know you're out there. I was at the house in Asbury Park last week and decided to stop in Manhattan on my way back to Maine. I found my hair canvas at Steinlauf and Stoller, Inc on W. 39th St. I knew just standing outside the building that they'd have it. 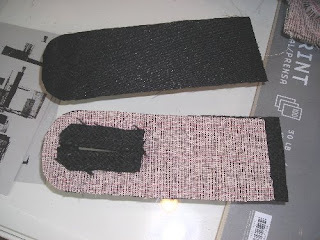 Their specialty is notions, interfacings, zippers, shoulder pads and such. It's such a drab, gray storefront surrounded by stores with windows full of the most colorful outrageous fabrics. Only a place as dreary as this would have hair canvas. Jackpot! I think they had four different types of varying weight and stiffness. A hair canvas bonanza! I can't wait to use it. 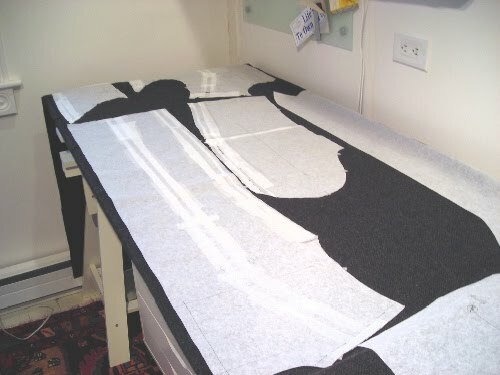 My next step is to pre-shrink the wool fabric, but I'll need a dry sunny day for that. 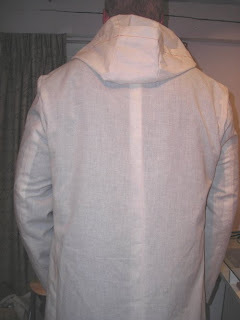 Here are pics of the final fitting muslin. 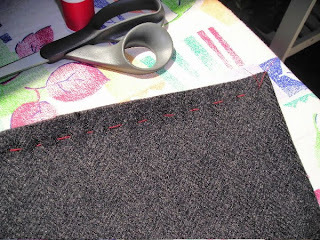 Considering that I had never altered a pattern before, I'm pleased with the result. It's come a long way from the first straightjacket, and it truly feels like it's time to be moving on. The next step will be to prepare the wool. Get ready for the London Shrunk Method. 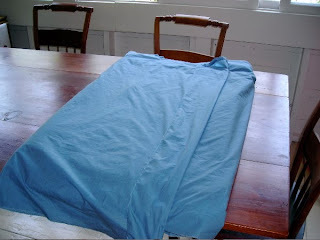 I brought the muslin (with one revised armscye) to dinner last night at Brian and Martin's. They both agreed that the fit was better on the altered arm, so I returned home today to complete the other side. 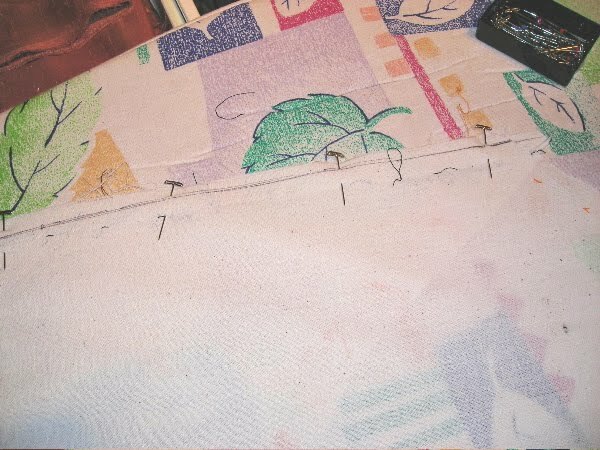 I've altered the sleeve patterns more than any other part. 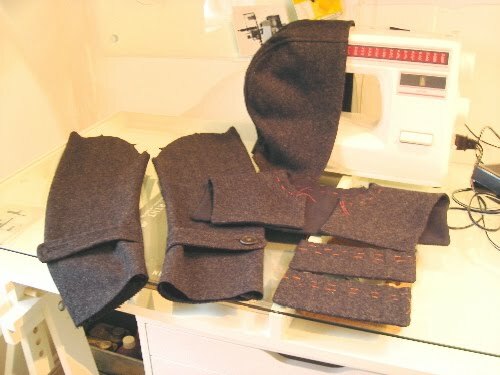 They're now shorter and wider both at the cuff and the shoulder. 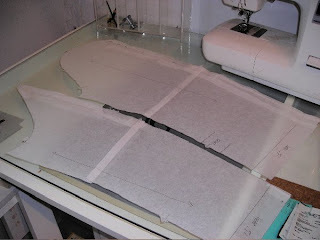 I think you can see how much I've cut and taped the pattern. I figured just to be safe I'd cut them out from scratch one last time. 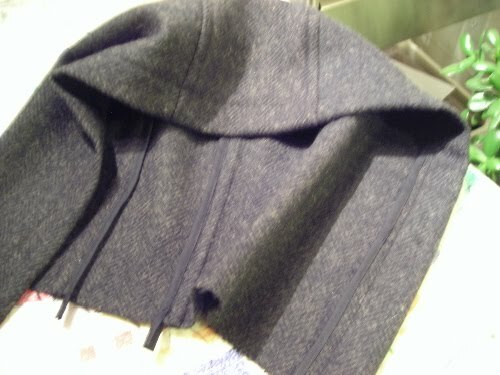 I'm glad I did, since the 2 pieces didn't line up over the sleeve cap at all. I'm getting less intimidated by the alterations, so I just trimmed the extended sleeve section off by eye. This has all been good practice for setting in the sleeves. I think I've done it 5 times so far. Practice makes perfect. If they mention Pi, it's over! 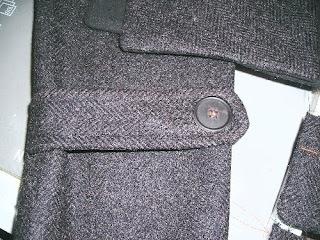 I started to research adjusting the armhole ( correct term: Armscye) and stumbled upon the Rundschau Sleeve System. Oh man, just take a look. I'm flashing back to algebra II! 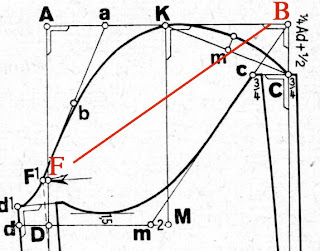 There is Mrs. Ladieu, in one of her smart Butte Knit outfits all covered with yellow chalk dust, graphing out a parabola while I break out into a cold sweat. SO, to preserve my sanity and keep this project moving forward, I boldly take out a Sharpie, mark out a 1/2" arc along the bottom of the armscye and cut the sucker out. 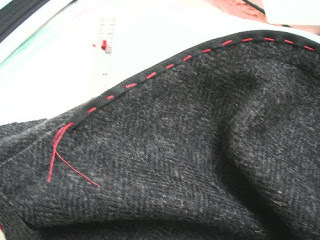 Now that the opening is larger I opened out the sleeve seam about 3/4" from the elbow to the shoulder. Ta Da! it all goes back together, the underarm wrinkles go away and the coat is much easier to get into. 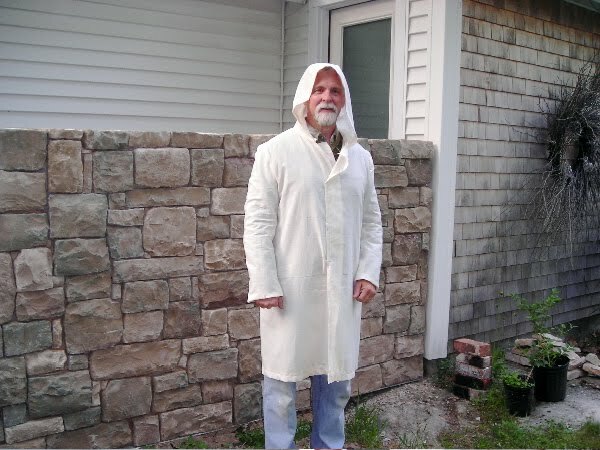 Huzbear Brian came over yesterday to help in the garden and agreed to take pictures of me in the new and improved fitting muslin. 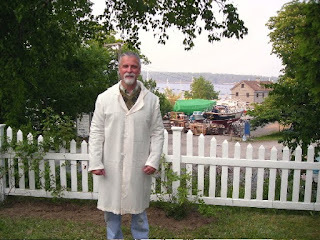 So I donned a flannel shirt and sweater, thank God it wasn't hot, and modeled the new version. The alterations I've made so far are a step in the right direction, but I'm still not convinced that it's fitting right. I think the shoulders are better and I like being able to close it in the front. That MAY come in handy this winter! It may still be a bit tight across my chest. The back is a complete mystery. Of course it doesn't help that I can't see back there. 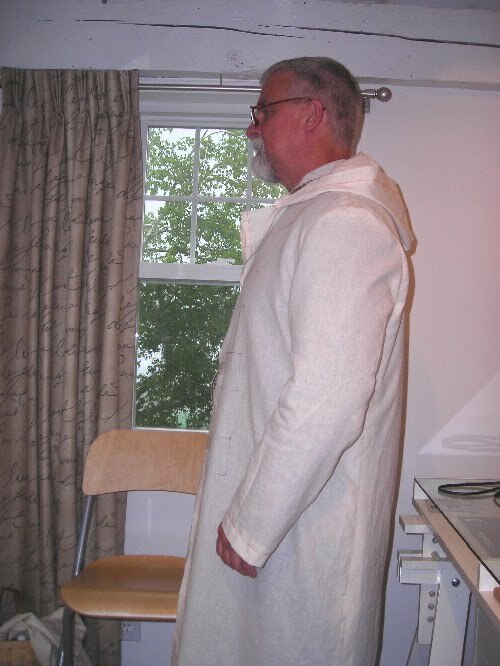 Brian thinks that the armholes are too small, and I'm tending to agree with him there. Maybe if I chop out about a 1/2" from the bottom of the arm opening, it would stop bunching up in the back? Thoughts from any followers would be appreciated. 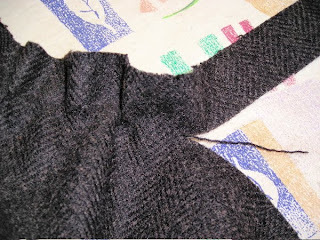 In the meantime I'm going to be researching how to change the armhole. This seems like very treacherous territory to me. The coat has a 2 piece sleeve, and its seam doesn't line up with the side seam of the coat. 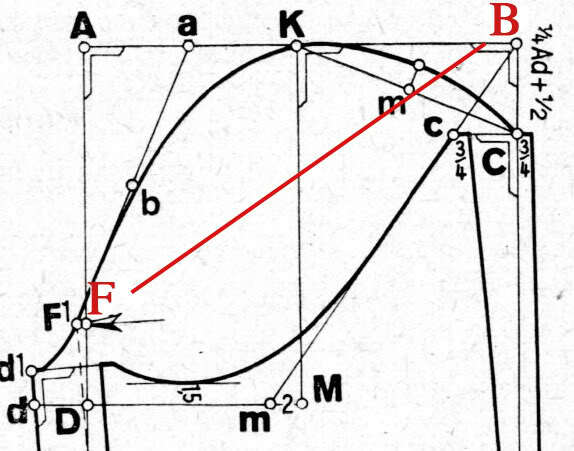 I feel like I need to call my Jr. High geometry teacher.